It’s shaping up to be an entertaining, high-scoring night of NHL hockey as 3 of the 11 games on the board have totals set at 6 or higher while the other ones all sit at 5.5. After a brief 2-5 funk over the weekend, we’ve bounced back with a 4-0 run over the last 2 days to get to a season-high +21.2 units on the campaign. Hopefully some of that good mojo lasts for at least one more night as we’ve got 4 wagers on tonight’s action. We technically have 5 bets ourselves, but the line on the Hurricanes Team Total Over 2.5 jumped 15 cents by the time we could publish this post. There may still be enough value on that wager at -150 odds or better if you’re interested in tailing, or you could also jump on that game at better odds in live betting if the Canes get off to a slow offensive start. 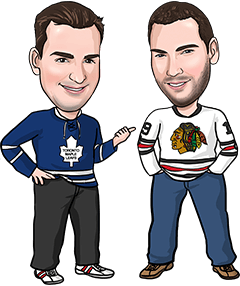 In case you missed it, we touched on that approach and more in an article we posted Tuesday about NHL live betting strategy, which includes advice from a friend of ours from Twitter. Alright, let’s get to the game breakdowns, picks and leans for today. Good luck if you’re tailing along or whatever else you’re on. Reasons to bet Los Angeles: The Kings are 16-12-2 on the road and look to bounce back from an embarrassing 7-3 loss Tuesday in Carolina. Pittsburgh has allowed 3+ goals in 5 of its last 6 games. Reasons to bet Pittsburgh: The Penguins have won 9 straight at home, scoring 4+ goals in 8 of those 9 games. LA has allowed 11 goals in its last 2 games and 4+ in 4 of its last 7 road games. Reasons to bet Anaheim: The Ducks outshot Detroit 33-16 Tuesday in a 3-1 loss at the Red Wings after going 2-0-1 in their previous 3. Chicago has lost 7 straight to fall out of legitimate playoff contention. Reasons to bet Chicago: The Blackhawks need to show some pride on home ice after getting outscored 14-3 during their 3-game road trip. The Ducks have lost 4 of 5 on the road and 5 of 7 overall. Reasons to bet Montreal: The Canadiens have outshot their last 2 opponents 93-57. Arizona is 7-16-4 at home and is playing its 4th game in 6 days. Reasons to bet Arizona: The Coyotes are 3-0-1 in their last 4 games. Montreal is 8-17-1 on the road, where it has scored 11 goals in its last 10 games. Reasons to bet Vancouver: The Canucks are a respectable 12-14-3 on the road. The Sharks have lost 4 of 5 at home. Reasons to bet San Jose: The Sharks are 8-0-1 in their last 9 games against Vancouver. The Canucks have lost 5 of their last 6 games, allowing at least 4 goals in 4 of those 5 defeats. Reasons to bet Carolina: The Hurricanes are 6-2-1 in their last 9 games. New Jersey has allowed 3+ goals in 5 straight games and 8 of 10. Reasons to bet New Jersey: The Devils snapped a 4-game losing streak with a late rally to beat the Flyers 5-4 in a shootout Tuesday in Philadelphia. Carolina lost 3 of 4 meetings last year. Reasons to bet the Rangers: The Rangers look to avenge a 7-2 loss at home to the Islanders in the last meeting Jan. 13. The Islanders have lost 6 of 8 and have been outshot by double digits in 7 of their last 9 outings. Reasons to bet the Islanders: The Islanders have won 5 straight meetings and 9 of the last 10. The Rangers have dropped 8 of their last 10 on the road. Reasons to bet Buffalo: The Sabres are oozing with confidence right now, going 3-1-1 in their last 5 games including wins over the Bruins and Lightning. Ottawa has 1 regulation time win in its last 13 games. Reasons to bet Ottawa: The Senators have won 4 of 7 and scored 3+ goals in 5 of their last 6. Buffalo is playing its 4th game in 6 days. Reasons to bet Detroit: The Red Wings are 4-2-1 in their last 7 games and have nearly as many wins on the road (11) as at home (12). Tampa has lost 3 of 5 and is playing its 4th game in 6 days. Reasons to bet Tampa: The Lightning simply owns Detroit, winning the last 10 meetings overall and 16 of the last 21 in Tampa. Reasons to bet Washington: The Capitals have scored at least 3 goals in each of their last 8 games. Minnesota has lost the last 6 meetings, including 3 at home. Reasons to bet Minnesota: The Wild is 20-4-5 at home this season and 7-2-1 in its last 10 overall. Washington has been outshot in 7 straight games and is just 4-3-3 in its last 10. Reasons to bet Calgary: The Flames are 16-7-5 on the road and have won 5 of their last 6 visits to Nashville. The Predators have just 3 regulation time victories in their last 10 games. Reasons to bet Nashville: The Predators are 11-1-4 in their last 16 overall and 19-5-3 at home. Calgary is playing its final game of a 6-game road trip. Reasons to bet Edmonton: The Oilers are the only team to have beaten Vegas twice this season. The Golden Knights have allowed 3+ goals in 5 of their last 6 games. Reasons to bet Vegas: The Golden Knights are 20-4-2 at home. Edmonton has allowed 24 goals during its current 4-game losing streak.